Yes, Apple Is Lining Up For A "Surprise" This Fall. And Yes, It's Likely An "iPad 3"
The following may sound a little crazy considering that the iPad 2 has not even been acknowledged or introduced by Apple yet. But from what we’re hearing, the next iteration of the iPad — let’s call it “iPad 3” to keep it simple — may be coming along sooner than people realize. Earlier today, HP held a big event in San Francisco to unveil their latest products based around the webOS software that they acquired when they bought Palm last year. One of these devices is a tablet, called TouchPad. The device looks like an iPad, but it has better specs. As such, some are already wondering if it’s a possible “iPad-killer”. Of course, the main problem is that the planned availability of the TouchPad isn’t until this summer. (And worse, there’s absolutely no word on pricing.). Then Daring Fireball’s John Gruber decided to quickly weigh in. “Summer feels like a long time away. If my theory is right, they’re not only going to be months behind the iPad 2, but if they slip until late summer, they might bump up against the release of the iPad 3. And not only did they announce this with a distant ship date, they did it with no word on pricing,” he wrote on his site. Did you catch the key phrase there? He snuck it in the middle, but it’s definitely there: iPad 3. This immediately led to Business Insider and others to speculate that the iPad 3 could be released this fall. But others weren’t so sure that’s what Gruber meant. They thought that perhaps he was just saying that a summer release would be close to a spring 2012 release for the iPad 3, which would be consistent with Apple’s cycle thus far. But we’re hearing something else. Something that does in fact place the iPad 3 in line for release this fall. A few days ago, we heard from a very good source that Apple was assembling the pieces for a “big fall surprise”. While intriguing, that could obviously mean anything. But the “surprise” part clearly means it’s something beyond the regular iPod/iTunes (and perhaps MacBook Air) refreshes that Apple does in the fall. Still, that leaves a lot of room for guesses. An actual Apple television? iTunes in the cloud? A touchscreen iMac? Who knows? Well, until today. We’ve now heard that this “fall surprise” is related to this would-be iPad 3. We don’t have any more concrete information beyond that. But, as of right now, the plan is apparently to release one iteration of the iPad in the next few weeks. And then blow the doors open with another new version in the fall. Obviously, this being Apple, that plan could change at any time. But here’s why it could make some sense. While again, Apple hasn’t publicly said the iPad 2 even exists, basically everything is known about it. Just last night, on the eve of the HP event, the Wall Street Journal ran a story confirming not only that the new device was in production, but also confirming many of the specs that have been rumored for months. That includes a front-facing camera, a faster processor, more RAM, and support for both AT&T and Verizon’s networks. The other thing they’ve confirmed is that the device would not have the higher resolution screen that some had been hoping for. For what it’s worth, we’ve heard the exact same thing. The screen of the iPad 2 will be the same resolution as the original iPad. So, aside from the camera and it being slimmer (which are a nice additions, but not a game-changing), it sounds like the iPad 2 will be to the iPad 1 what the iPhone 3GS was to the iPhone 3G. That is, a faster, more polished offering. And that’s fine. Considering that over a year after its initial unveiling, no one else has a tablet out there yet that can hold a candle to the iPad, adding speed and polish should be more than enough to keep it far ahead this spring. But Apple isn’t stupid. They can see the armies forming around them. Everyone wants in on this tablet business. And come this summer, there should be a few interesting offerings in the space from competitors — like the HP TouchPad. The iPad 2 will likely still be ahead of those products. But Apple has a history of not resting on their laurels. That’s perhaps the key reason why they’ve been so successful in recent years. And that’s exactly why they strike with the iPad 3 in the fall. Now, I have no details as to what this iPad 3 would include. But one very solid guess is a retina-like display that the iPhone 4 currently has. There’s obviously been many rumors of this for the iPad 2, but it’s not happening yet. But perhaps it could this fall. Another, slightly smaller form factor will clearly be another guess. Steve Jobs has famously played down that idea in the past — but he often does that and turns around with an offering. Another interesting question will be how Apple would pitch such a quick upgrade to consumers? 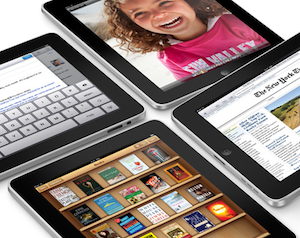 Would those who bought the iPad 2 this spring be mad if a new version hits in the fall? Sure. But maybe Apple has more pricing tricks up their sleeve. More to come on this, I’m sure. Update: In a new post, Gruber has clarified his “iPad 3” remark. While he calls it an actual guess, he says that he thinks an iPad 3 could hit in September alongside new iPods. And while his reasoning is in some ways the inverse of mine, we arrive at the same conclusion. Gruber thinks the new iPad we may see in the fall will be more of a “iPad 2.5”, whereas my guess was the other way around. He thinks the launch date could have more to do with Apple attempting to move the yearly release schedule of the iPad to be closer to the holiday season. Again, that’s just his guess, but it also makes quite a bit of sense. But I’m certain that Apple sees the potential and the high stakes. They’re not going to leave any gas in the tank pushing the iPad hardware specs forward as fast as they can. Again, to be clear, my information on this isn’t a guess (though my thoughts as to the reasons why Apple would do this are). Apple’s plan, at least right now, is to release another version of the iPad in the fall. That may change, but that is currently the plan.